Potato farmers in Rwanda look forward to growing improved potato varieties with good processing quality. 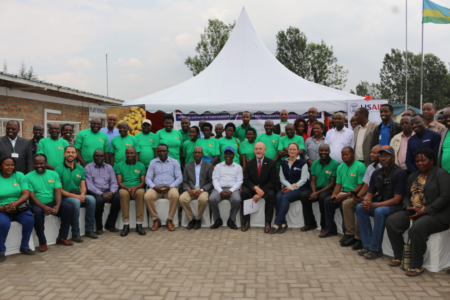 This follows launch of a new project which will introduce new potato varieties that can be grown across the country including the warm mid-altitude areas of Rwanda. This project will be implemented by the International Potato Center (CIP) in collaboration with the Rwanda Agricultural Board (RAB). The initiative is made possible with support from the United States Agency for International Development (USAID) through its Private Sector Driven Agricultural Growth project (PSDAG). 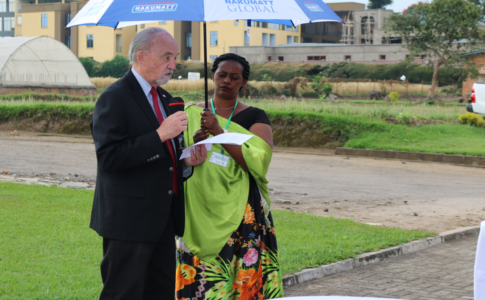 “It is our hope that the project will not only increase food in most Rwandan households but also grow farmer’s incomes,” said Kevin Armstrong, the USAID deputy mission director in Rwanda during the launch on 1 August. So far, 21 CIP materials have been tested for agroecological zones adaptability, yields, disease and heat tolerance as well as processing traits in various parts of the country. “At CIP, we have focused our breeding efforts on developing new potato varieties able to withstand various stresses such as late blight (LB) disease, drought tolerance and heat tolerance. Subsequently, we now have a set of potato advanced materials with LB and virus resistance, and also with good processing quality, developed for Rwandan agricultural conditions. Field results collected through the CIP-RAB partnership have demonstrated the superior field performance of such materials,” noted Thiago Mendez, Potato Breeder at CIP. Through this new partnership, at least six varieties are expected to be released in the near future. Some of these will be suitable for various purposes such as processing, consumption as well as for commercial use. According to Dr. Charles Bucagu, the Deputy Director General of RAB in charge of Agriculture Research and Technology Transfer, “this exercise will enable farmers to have a wide range of varieties to grow depending on their location.” Habimana Jean who works in the potato fields of RAB in Kinigi station testified that the new potato materials looked promising. Compared to the existing potato varieties, Jean noted they had a bigger size, good shape and most of them were not easily infected by diseases. CIP Rwanda Country Manager, Dr. Kirimi Sindi, said this initiative will provide farmers a chance to grow a variety with a particular purpose. “Looking on the market, there is only one variety called Kinigi that is competed for by all the people and factories either for cooking or processing. But this time, we shall bring to farmers different varieties suitable for various purposes including processing and consumption,” he remarked. Dignitaries at the event included officials from the Netherlands Embassy, USAID, Ministry of Agrticulture, as well as potato seed multipliers, farmers among others. They visited the tissue culture lab at RAB station in Musanze and inspected the seed bulking block that hosted all the 21 new potato materials. Furthermore, they visited farmer Hakizimana Thomas who hosted trials of the new materials. 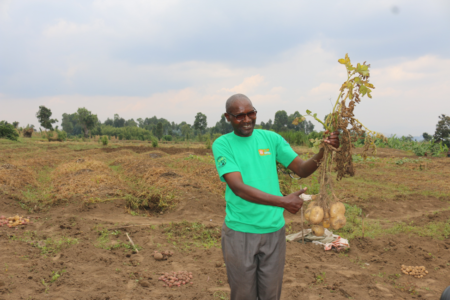 “When i compare these materials to the potato varieties I have been growing on my farm, I have realized they (new materials) will give much more yield hence more incomes for farmers as well as food for our families,” said Hakizimana who is looking forward having new varieties soon. The new project is named, “Evaluation and selection of disease resistant potato varieties with good processing qualities for Rwanda”. 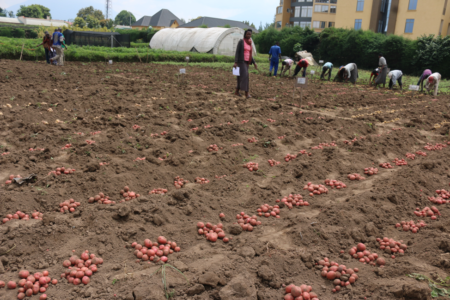 New potato varieties ready to be released in Rwanda: Top Africa news. Blog by Donata Kiiza – CIP Rwanda with contributions from Vivian Atakos – CIP-SSA.